If you’ve been to our gym in Bloomfield, NJ, you know how we emphasize healthy eating. Well, healthy drinking is also part of that program. Of course, I’m talking about the non-alcoholic type of drinking. Drinking plenty of water is important and cutting out sweet drinks like soda or even fruit drinks helps boost your overall health and hydration. There are other low or no calorie drinks that help. A cup of black coffee consumed before working out can make you more productive. There are also many benefits of green tea that should make you add it to your list of healthy drinks. Want to burn fat and boost your metabolism? Just like coffee, the caffeine in green tea can boost your performance in the gym, but without the side effects of the jitters. Green tea also increases your metabolism. That’s why it’s often in many weight loss products. In several trials, green tea increased the body’s energy expenditure by as much as 4 percent. It also was shown to increase the oxidation of fat by as much as 17 percent. The results vary from individual to individual. It’s the compounds in green tea that make weight loss easier. You already know that tea contains caffeine, even though it’s not as much as coffee, which helps boost metabolism. It also contains antioxidants called catechins. One of those is epigallocatechin gallate—EGCG, a catechin that boosts metabolism. Green tea can also improve the effects of hormones that break down fat cells so the body can use them for energy. One of the hormones is norepinephrine. It does that by providing EGCG that slows the production of the enzyme that breaks down the norepinephrine. Combining the caffeine with the EGCG boosts both of their benefits. Green tea has a host of other healthy benefits. You’ll protect your brain when you drink green tea. Some studies show that its antioxidant affect can not only help protect the brain but also improve short term brain function. It can help protect the dopamine producing neurons in the brain and lower the risk of Parkinson’s and Alzheimer’s. The increased antioxidants in the blood can protect the heart. Green tea also may be effective in preventing insulin resistance, which lowers the risk of diabetes. To be the healthiest, you need to drink green tea without sweeteners. Squeezing a bit of lemon in it not only adds flavor, it adds nutrients. Studies show that people who drink more green tea, five or more cups a day, lived longer. 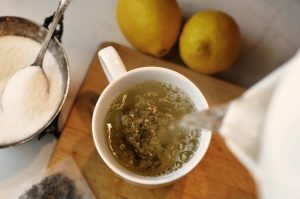 While the results of studies vary as to whether green tea can aid in weight loss, drinking a no calorie drink will certainly be a significant improvement over a sugary carbonated drink and save calories. Green tea catechins help lower the risk of the flu and your risk of infection. It can also help inhibit the growth of bacteria that causes tooth decay and help lower the risk of bad breath.